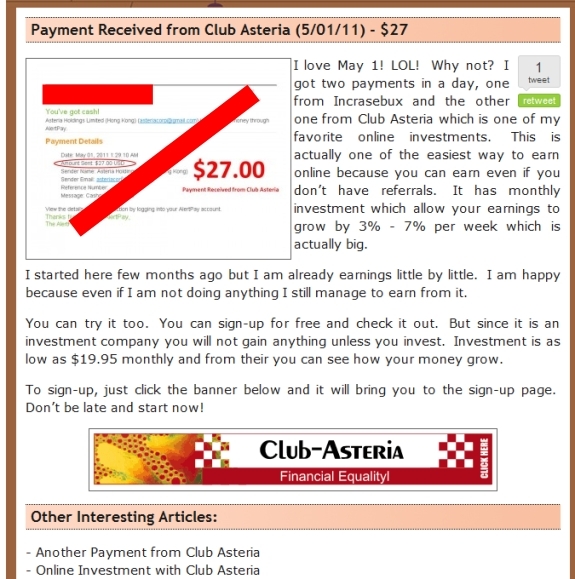 This May 1 promo for Club Asteria describes its as an "investment company" and instructs prospects that "you will not again anything unless you invest." The promo advertises returns of up to 7 percent a week. "I am happy because even if I am not doing anything I still manage to earn from it," the promo claims. In June 2010, the U.S. Department of Justice used its Blog to warn about the emerging threat of “mass marketing fraud,” specifically citing the criminal allegations of a $70 million Ponzi fraud against Nicholas Smirnow of Pathway To Prosperity (P2P). P2P was promoted on the TalkGold and MoneyMakerGroup Ponzi forums. A little over a month later, in July 2010, the Financial Industry Regulatory Authority (FINRA) described the HYIP sphere as a “bizarre substratum of the Internet” and issued a fraud alert. FINRA also referenced the P2P case. At the same time, it pointed to the collapsed Genius Funds Ponzi, believed to have consumed $400 million. Genius Funds also was promoted on TalkGold and MoneyMakerGroup. In December 2010, the interagency Financial Fraud Enforcement Task Force led by U.S. Attorney General Eric Holder specifically warned the public to be wary of social-networking sites and chat forums. The warning was part of “Operation Broken Trust,” a law-enforcement initiative in which investigators described more than $10 billion in losses from recent fraud cases. One of the cases described was the SEC’s action against Imperia Invest IBC, a murky offshore business accused of stealing millions of dollars from the deaf. Imperia Invest also was promoted on TalkGold and MoneyMakerGroup. 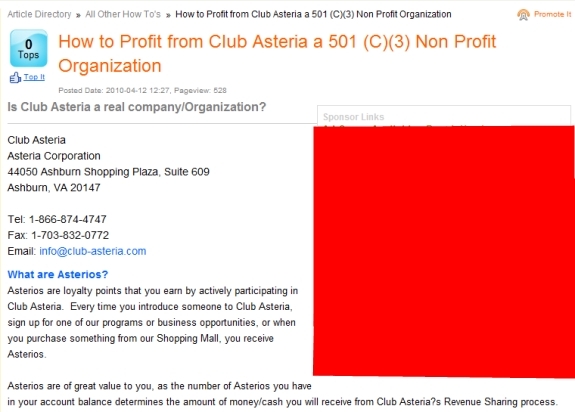 Last week, promoters of a Virginia-based company known as Club Asteria (CA) announced on the Ponzi boards that PayPal had frozen CA’s funds and blocked its access to the PayPal system. Although CA has been presented as a wholesome “opportunity” recognized by the Internal Revenue Service as a nonprofit organization (see graphic below), the CA promoter who announced the PayPal news last week on MoneyMakerGroup simultaneously was promoting two “programs” that purportedly pay 60 percent a month. Some CA promoters claim CA pays 520 percent a year. Even jailed Ponzi schemer Bernard Madoff would blush at such advertised rates of return. MoneyMakerGroup is referenced in federal court filings as a place from which Ponzi schemes are promoted. So is TalkGold, another well-known forum in the HYIP world. This morning — also on the MoneyMakerGroup — a different CA promoter announced that CA’s Andrea Lucas had responded to last week’s PayPal news. Even as the CA member was announcing on a known Ponzi scheme and criminals’ forum that Lucas had issued a statement on the PayPal matter, he simultaneously was promoting two HYIPs and something called One Dollar Riches. The mere presence of CA promotions on the Ponzi boards leads to questions about whether the firm’s receipts are polluted by Ponzi proceeds. Paying members from such proceeds would put CA members in possession of tainted money — and banks into which they deposited those proceeds also would be in possession of tainted money. Lucas, according to the CA website, now has publicly acknowledged last week’s actions by PayPal. Details, though, were spartan. CA did not say how much money PayPal had frozen. Meanwhile, the firm instructed members to fund their accounts by using offshore processors. At the same time, CA urged members not to spread bad news about the company on forums. Members who shared negative information were subject to having their CA accounts revoked, according to the company. “Members shall not publically (sic) disparage, demean or attack Club Asteria, its members, services or charitable activities,” CA remarks attributed to Lucas on the CA website read. The remarks were dated May 16 and appeared in the “News” section of the site. The company claimed it had turned the members “over to the authorities,” but did not identify the authorities or say whether they were based in the United States or elsewhere. CA, which said PayPal was “acting with integrity,” then counseled its members to rely on offshore processors. “First, if you have been paying for your membership through PayPal, please discontinue your subscription with PayPal immediately and start using one of the other approved payment processors AlertPay, Towah or CashX to ensure that your membership stays current,” the remarks attributed to Lucas read. CA’s bizarre announcement occurred against the backdrop of thousands of bizarre promos for the firm that appear online. Some promos claim $20 spent with CA monthly turns into a lifetime income of $1,600 a month. Others claim CA is a “passive” investment opportunity, which raises questions about whether CA — whose members claim the program typically pays out about 3 percent to 4 percent a week or up to 208 percent a year — is selling unregistered securities as investment contracts. CA’s claims that only a “small group” of members is causing problems may be dubious. Wild claims have been made in promo after promo for the firm, which says it is not in the investment business. This promo for CA contains a link that resolves to an active CA affiliate site. The affiliate site has a low affiliate ID number, suggesting the affiliate was one of CA's earliest members. The promo claims CA is a 501 (c)(3) nonprofit organization recognized by the IRS. There is a difference between a “Promotion,” and simply having a thread about a program on a forum, created by a member, and thus presenting an open two sided discussion about it. I wonder how many people steered clear of P2P because of their threads on these forums. This article is one sided. Robert Morindin: There is a difference between a “Promotion,” and simply having a thread about a program on a forum, created by a member, and thus presenting an open two sided discussion about it. I wonder how many people steered clear of P2P because of their threads on these forums. This article is one sided. TalkGold and MMG are Ponzi cesspits referenced in federal court filings. They are routinely used as launching pads for scam after scam after scam. Alongside the TalkGold thread is an ad for a program that purports to pay a return of 9,860 percent after six hours. Above that ad is an ad for a “program” named a defendant in a January sweep by the CFTC. Some of the defendants named in the sweep have been linked to a payment processor whose purported contact person is referenced in a Ponzi forfeiture complaint in which the Feds tied cash to the international narcotics trade. TalkGold and MMG are dangerous places. They destroy wealth; they destroy relationships; they destroy families. Forum participants very well could be channeling money to organized crime and terrorists — and the forums try to wash their hands with a disclaimer and a claim that naysayers’ points of view are welcome. The naysayers are welcome only until they become unwelcome, of course.